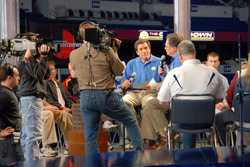 On Thursday, April 9, a select group of some 30 drum corps fans, members and alums gathered at Lucas Oil Stadium in Indianapolis to sit in as a live studio audience while camera crews taped exclusive features that will appear as part of Drum Corps International's spring cinema event "The Countdown." After watching each of the six full-length drum corps performances, longtime DCI broadcasters Steve Rondinaro and Dennis DeLucia were on hand to lead audience members from Lucas Oil Stadium's "Horseshoe Stage" in on-camera discussion about each of the featured programs. Check out this photo gallery from the event. The Countdown will appear in more than 400 theaters nationwide on Wednesday, May 13. Tickets to the event went on sale today, Friday, April 10. View a complete list of participating theaters. Learn more about "The Countdown." Photos by Missy Berg, Ric Oberlin, Chris Weber.